Last week, I and a group of us from the Institute on Blindness presented at the 2013 IDEA Leadership Conference, where more than 1,200 directors of special education and school superintendents gathered to—in the words of the conference mission statement—”support better outcomes for infants, toddlers, children and youth with disabilities and their families.” This year, the conference focused upon innovative practices that lead to better standards for the education of students with disabilities. In our 90-minute session, we explained the research, testing, and implementation of the National Reading Media Assessment. The response of those who attended our session truly surprised me. When we have presented this at blindness conferences, we’re always faced with skepticism and pushback. At this conference, the response was the opposite. Halfway through the presentation, I was interrupted by one audience member who commended the work we’ve done in making the NRMA such an objective measure of blind students’ needs. When we’ve talked with people in the blindness field, we’re considered the radical, militant group trying to “make kids be blind.” To me, these students already are blind or have low vision, so teaching them to read isn’t making them blind…it’s preparing them to succeed. People in our field get up in arms because they get emotional about deciding whether a student needs braille or large print. They were trained and indoctrinated for years in this idea that “visual impairment” isn’t as horrible as “blindness,” so they use what they believe to be a more politically correct monicker: visual impairment. However, when we talk about what we do to the average person, it makes logical sense. The average person understands that if reading print is not sustainable for a blind kid, then that student should learn braille, a medium that objective research has proven to lead to higher employment, more opportunities, and future independence. An objective look at the NRMA will show you that it’s logical, thorough, well crafted, and based on sound research. I still remember when we sat down to create this assessment, and the most pro-braille people you can imagine said we couldn’t write a test to find students’ deficiencies and where students failed. The way teachers are trained, I knew, was to give positive reinforcement. Positive reinforcement is a good teaching methodology, but you have to put that aside when you’re assessing a student’s needs. You can’t intervene with the best strategy if you don’t objectively look at what’s happening now and what will happen for that student as the amount of reading increases and the font size decreases. 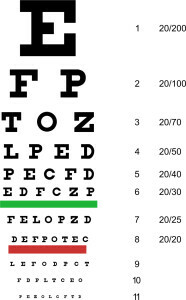 Think about the Snellen eye chart. If you tell the doctor that you can’t see past the first big letter “E,” he doesn’t say, “Well get closer. Let me adjust the lighting. Try harder.” The doctor looks for an objective measure of what you see, and only then does he propose glasses, further evaluation, or alternative techniques. However, that’s exactly what traditionally-trained professionals do when assessing a student’s potential accommodations. The NRMA takes an objective look at a student’s functioning. To me, I’d rather fail a student on an assessment than fail them in life. Too many so-called professionals don’t want a student to go home with a bad report about their level of visual functioning, and it’s because of that emotional decision that too many blind students are reaching high school as functionally illiterate. For those of us who teach a positive view of blindness, sometimes failing blind kids on visual assessments are in their educational best interest. That’s your job, I said to them and I say to you. We present this to you so that you can take it back to your state, and what I think came from the conference is this notion that what we’ve accomplished is significant. Now, though, the big hurdle is determining how we get the world to listen. We need states to adopt the NRMA as a standard tool. Casey Robertson described how Mississippi did it, so now it’s your turn.